Clubbing of Income meaning including income of another person in your income. An obvious question is why you should do that? It will unnecessarily increase your tax liability. Yes, you are correct, however in certain circumstance you cannot avoid clubbing of others income with your income. The income tax department wants to make sure you are not evading tax using your income (Income tax section 60 to 64). You are buying a house for your parents or any other person especially non-earning member either due to emotional attachment or for providing financial stability. So you are transferring your income without transferring asset. Suppose that house is given on rent and started generating income. Income earned by this means will be clubbed with your income. Income earned on Income shall not be added in your income. In another word if the income generated from the rent is reinvested by owner and further income is generated. This income will be considered as income of the owner and not yours. Clubbing of income is not only applicable to income but also to capital gain. Suppose asset is transferred on name your relatives or parents and transferee sell this asset without consideration. Capital Gain arising from such a transaction shall be added in your income and you are liable to pay taxes on this income. Suppose you purchased fixed deposit on the name of your child in the bank. Bank is paying interest on this fixed deposit. This interest amount will be clubbed with your income. In case if parents are divorced, this income will be added into the income of father or mother who is holding custody of minor child. Maximum deduction of 1500 Rs per minor child is allowed as per Income tax rule. You are buying shares or mutual funds on the name of your wife. The income earned from these mutual funds or shares will be added or clubbed with your income while filing income tax return. Suppose your spouse is receiving a salary from the firm and you have 20% ownership/stake in that firm entire income will be clubbed with your income. Suppose you transfer an asset to the wife of your son and there is income earned on this asset. This income will be clubbed with your income and you need to pay tax on this income. You are giving some money as a gift to your major child. Your child invests this money for purchasing any other asset and generate income out of it. This type of income will not be added in your income. It will be considered as income of your major child. How I Can Reduce Tax with Clubbing of Income? If you are making an investment from your money on the name of your child or spouse you can save tax by investing in PPF, ELSS or other tax saving instrument. You can take advantage of 80C tax benefit by making these investments. You can invest in Senior citizen saving scheme on the name of your parents and you can earn a tax-free return. You can save taxes by giving a direct gift (money) or loans to your parents, relatives or in-laws because clubbing of income does not apply here. You can give an interest-free loan to your major child. This will help you to save taxes. If your child is earning money, but he is in the lower tax bracket, you can give him money as a gift and reduce your tax burden. Many people make a mistake of not including income from clubbing while filing Income tax return. Hope you have checked Clubbing of Income rule before filing your income tax return. If you have not filed your income tax return please refer to tutorial given here for filing income tax return. 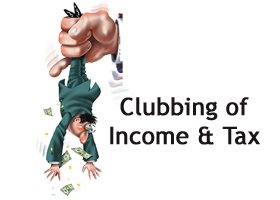 To explore more detail about Clubbing of Income refer to FAQ given on Tax Guru. Don’t forget to share this information with your friends! I need to do a ITR return . I opened some FD on my Wife name & TDS deducted on her name , How can i show the interest earned in my ITR filing as TDS deducted on her name PAN.. can i go clubbing of income ,should i add the interest amount with my salary ?where should i put that amount in ITR filing . Can i show the TDS deducted on her PAN in my ITR filing as the interest earned is on my source income .. or she can claim it as refund . Is this amount visible in form 26AS of your Wife? If yes refund can be claimed.